And while this lack of confidence doesn't make itself known to the world at large, it is crippling in it's ability to lay me out, when all I want to do is shine. I couldn't even tell you what the voices in my head are saying, I don't hear them any more, because it is so deeply ingrained in my being that I am not that I can set myself into a tail spin without even opening my mouth. Take blogging for example. I've been at it for 9 years now. I love writing, and preserving my story, our story. Toni and I joke all the time why aren't we big like that blogger who's been blogging for five minutes?, after all, we've been at this gig a long time. But I realised last week that I've been chasing the wrong dream, someone else's dream. And once I realised that, the rest of my struggles melted away (well, not quite, sitting at the computer without a child on my back is still difficult) But it wasn't until I started to ramble and actually voiced the words that were caught up inside me that I could see that I had value, that I was important in my blogging journey. 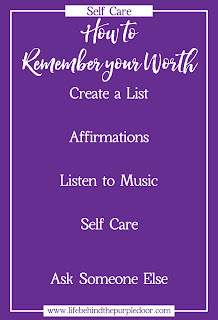 So, while I'm emotionally hungover (my new favouritist term in the world) and struggling with feeling right, how do I remember that I have value? By focusing on the things that I can control, and reminding myself, as I try to remind the kids on a daily basis, that the only person who's actions I can control are mine. Because while it's really easy to say the words, and compare myself to someone else's journey, actually doing something to change that response is probably the hardest thing I have ever done in my life. I'm the excuse-slayer, remember? I'm obsessed with lists at the moment. Maybe it's my bullet journal finally rubbing off on me, but if I'm thinking something over, the easiest way to see it outside of my head is in a list. 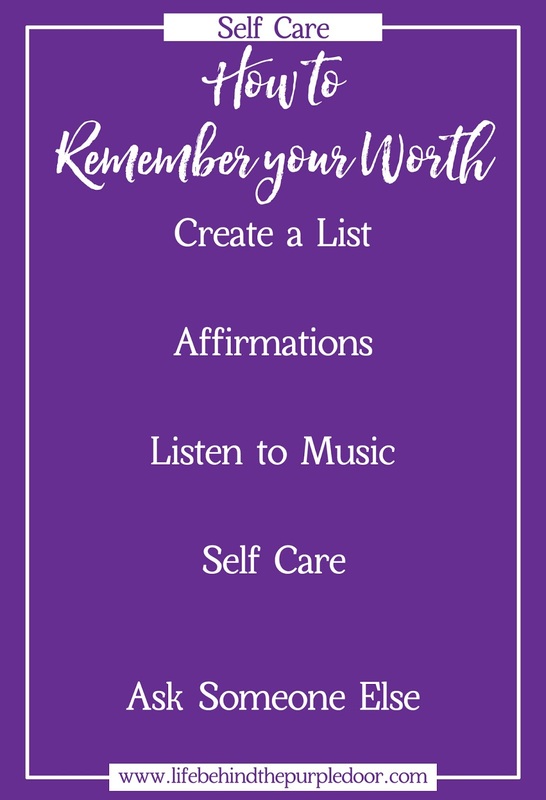 And the second I finish writing this, I'll be creating a list of all the valuable things I do, and reminding myself often of them. Like lists, I'm obsessed with Robbie Williams' new song "Love My Life" Have you listened to the words? "I am powerful, I am beautiful, I am free, I love my life" I think the kids are fed up with it already, because it is on repeat. endlessly. every. day. I've just created a playlist that I titled "inspired" and filled it with kick-arse music that will drive the kids nuts I love listening and singing to. From Katie Perry's Rise to Guy Sebastian's Don't Worry Be Happy, I'm sure to dance my way out of a funk. I've never really understood the power of affirmations, but playing that Robbie Williams song over and over has finally explained it to me. In a fabulous piece of synchronicity, this marvellous post from Marc and Angel was shared in the One Little Word® classroom this month. Another thing to create a list for! I have always prioritised doing my thing over housework, because I have always truly believed that "to have happy kids, you need a happy mother" But as we walk this path with Douglas, I've come to realise that it hasn't been as a high priority as I thought it was. I mean, my practise for One Little Word® this month is to create every day, but I've given myself all sorts of outs like "baking is creativity", "writing is creativity" (and while I believe all those things are creative, the point is I've made an excuse not to focus on just one aspect of creativity) And while self-care is more than a glass of wine and a bath, taking time for those basics is important, too. When I popped that post up on instagram, I didn't expect to connect with other people who were also struggling. In fact, it wasn't even the thought I had intended when I started writing! But it struck a nerve with other mums and bloggers alike, who commented and messaged and said out loud we see you. Sometimes sharing the weight with someone else really does make it seem so much less. And if you're looking for some realism, just ask your kids what they think you do all day, they'll bring you down to earth with a bang! 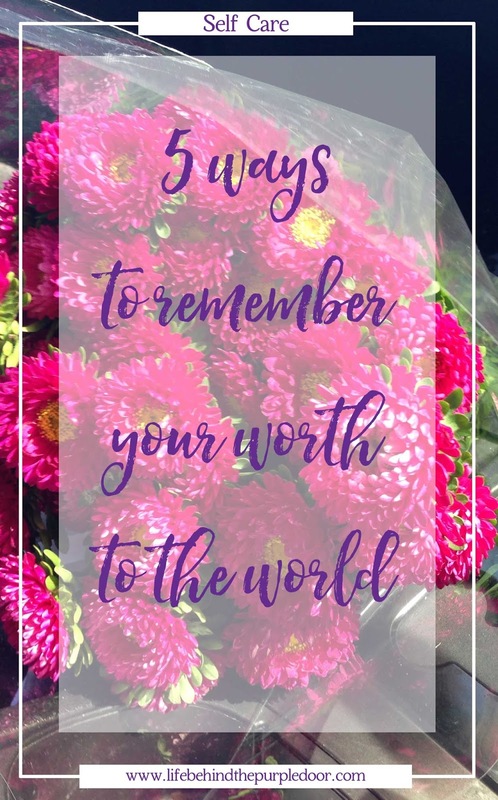 How do you remember your value to the world? This is so true lovely. I have been caught up chasing the dream I thought I was meant to chase only to find that no matter what I did, I wasn't feeling happy anyway. It has only been in the past couple of years that I have found my life's purpose and now I slowly work towards that - no rush as life is here for me. Great tips. I love that you have realised you are following your own story, not someone elses place in the world. So important. I've been blogging for a long time now. At first I used to care what others thought, I used to want to be one of the 'big' bloggers. Now I just write. Most of what comes out is a bit odd, I see the world differently sometimes. But I'm okay with that now. My story. Great tips on how to "re-wire" our thoughts when you get into a mental slump! Will definitely give these a try next time. I think writing to seek internet fame is probably not the healthy way to go. We all want to connect and have readers, for sure, but I like that you've realised your real purpose here. Mum bloggers hold enormous value in telling the stories of their lives in ways that women have never had the opportunity to do before. Music is so good for getting back on track. I've been listening to youtube a lot at night while I'm trying to be productive and I get so much more done because I'm content while listening. I think everyone needs a purpose and it looks like you've found yours! I'm reminded of the quote "a flower does not think of competing with the flower next to it, it just blooms."